The Boyle Heights Sears retail store opened on July 23, 1927. It was the mail order company’s second Los Angeles outlet- the first, at Vermont & Slauson, having been completed just a month before. Bruce had enlisted in the Army in 1940 at age 18. 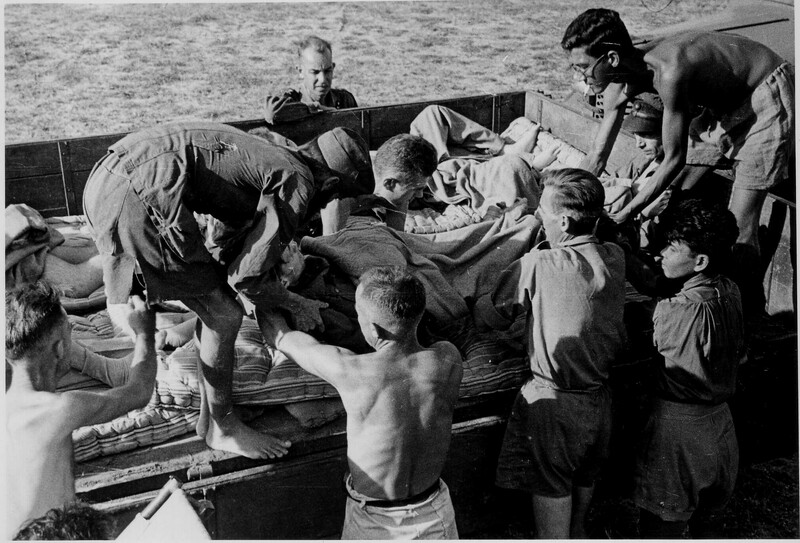 A survivor of Corregidor and the Bataan Death March, he was transferred to the prison camp aboard a Japanese “hell ship,” and spent 3 years at Osaka before it was liberated by the Allies on September 2, 1945. Resisting the urge to attack his former nemesis on the spot, Bruce had the presence of mind to follow Kawakita out of the store and took down the license number of his car. He then promptly reported the information to the FBI. 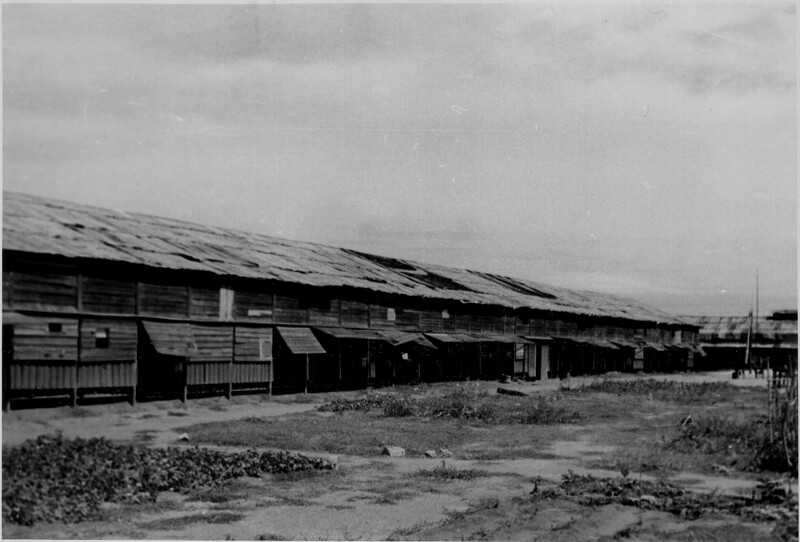 Federal authorities began a months-long investigation, tracking down other veterans from the camp, and building a case that culminated with Kawakita being indicted for treason on June 5, 1947. This true story, reported in the LA Times on June 6, 1947, inspired The Clay Pigeon. Kawakita, 26, was Japanese-American, a Nisei, born in Calexico, CA to Japanese-born parents. In 1939 he traveled to Japan to attend Meiji University in Tokyo and was still there at the time of the December 7, 1941 Japanese attack on Pearl Harbor and the Philippines . 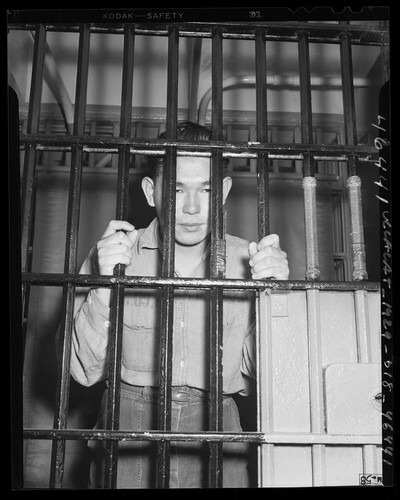 Kawakita aka The Meatball in LA County Jail, 1947. 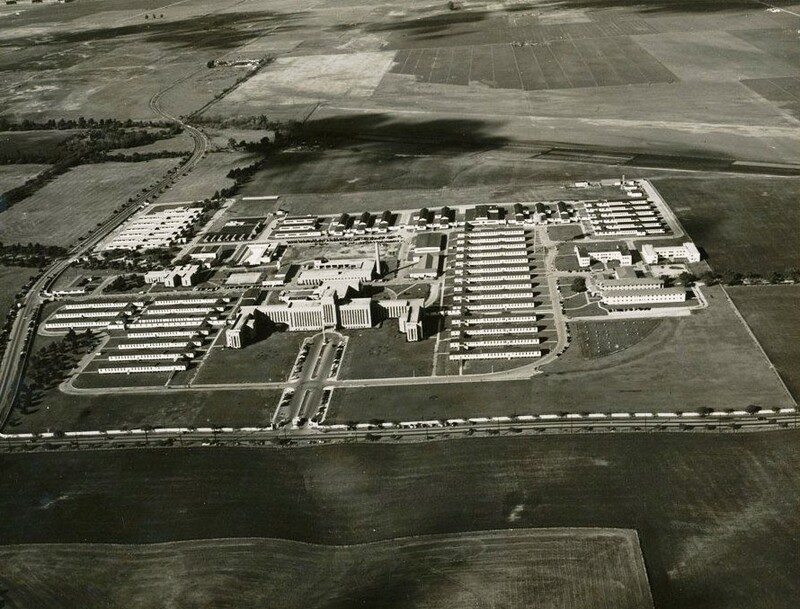 USC. 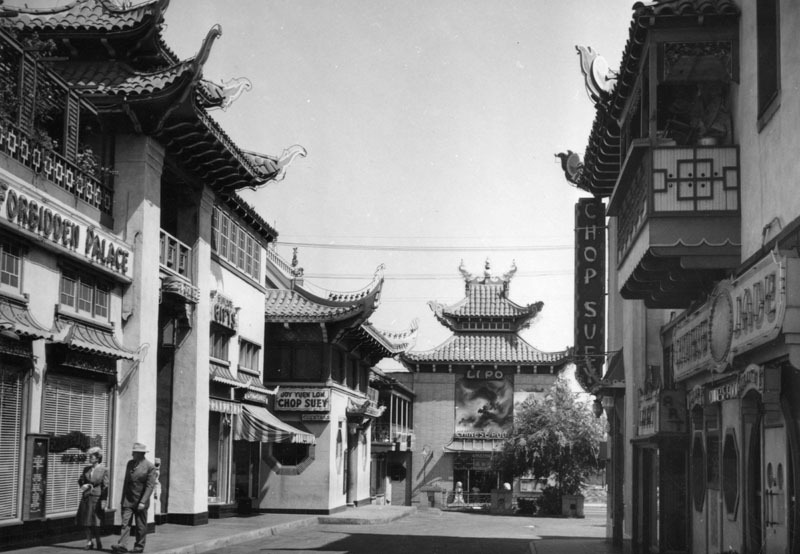 Kawakita’s 11-week trial began in Los Angeles in June 1948. Representing the defendant was Morris Lavine, who presented his client as “just a young boy” facing “trumped up” charges . 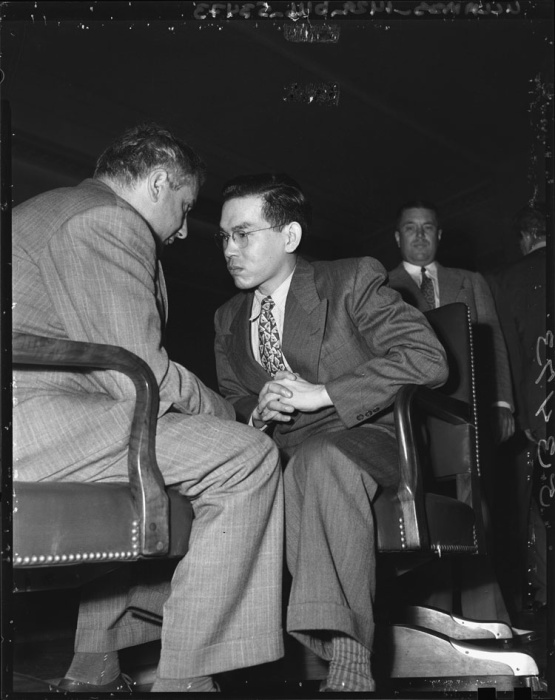 Kawakita in court with Lavine, 1947. USC. Bruce testified along with several other former POWs, telling of the cruelty and abuse they experienced at Kawakita’s hands. On September 2, 1948, the jury of three men and nine women found Kawakita guilty of 8 overt acts of treason for his treatment of the US servicemen . Hollywood screenwriter Carl Foreman, himself a WWII veteran, is said to have been inspired to write The Clay Pigeon after reading about Bruce’s chance encounter with Kawakita in the newspaper. In the film, it’s Jim Fletcher, a Navy veteran and Japanese prison camp survivor, who is facing treason charges. While trying to clear his name, he runs into his former guard, Ken Tokoyama (aka The Weasel), at a restaurant in LA’s New Chinatown. 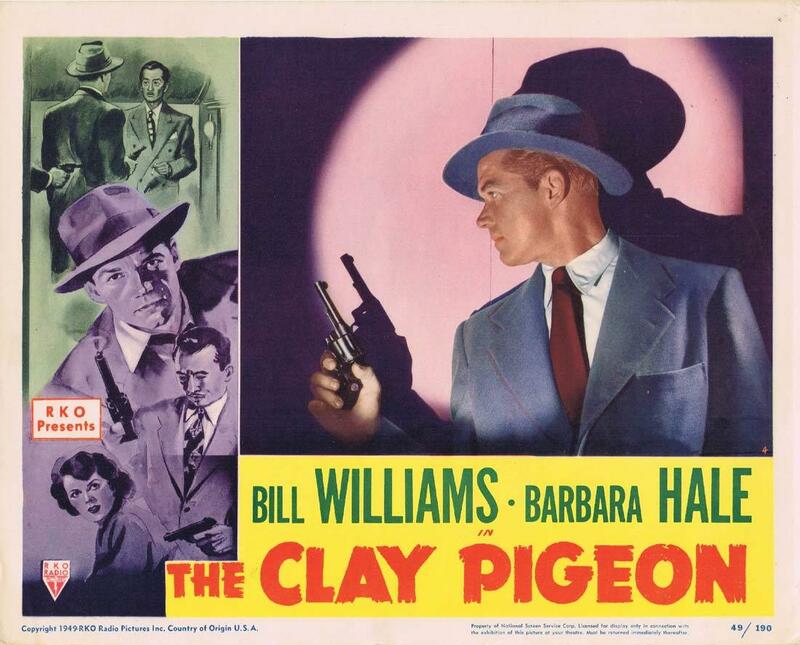 The Clay Pigeon opened in Los Angeles theaters- the Hollywood Pantages and RKO Hillstreet– February 23, 1949, as the second feature on a double bill with Disney’s technicolor extravaganza, So Dear To My Heart. 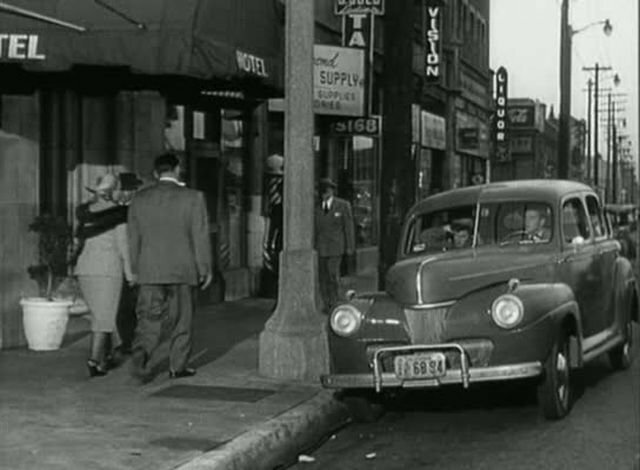 Also opening that day was Act of Violence, MGM’s big budget noir, also set in Los Angeles. Coincidentally, it had a similar theme- that of a veteran seeking revenge on a fellow serviceman for atrocities that occurred while they were both POWs. 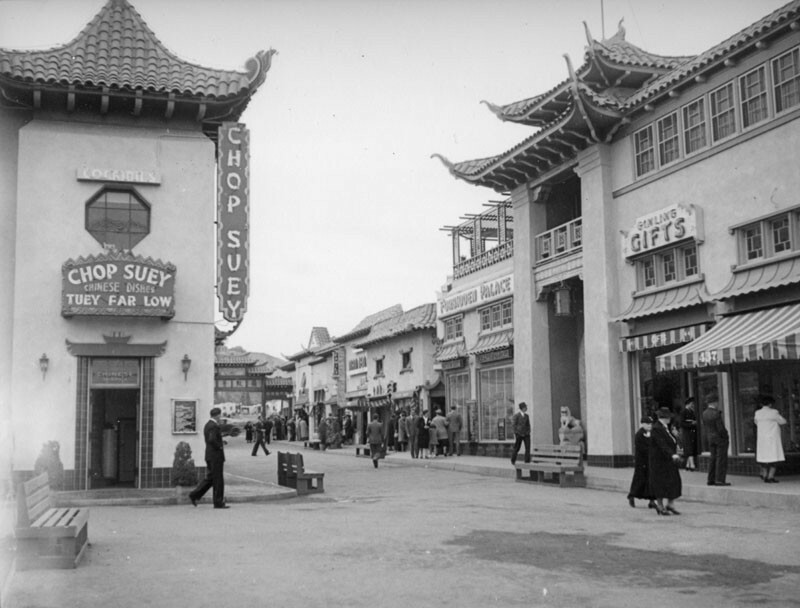 The Clay Pigeon was shot partially on location in Los Angeles, most notably in and around New Chinatown, so called because “old” Chinatown had largely been demolished for the construction of Union Station starting in 1934. 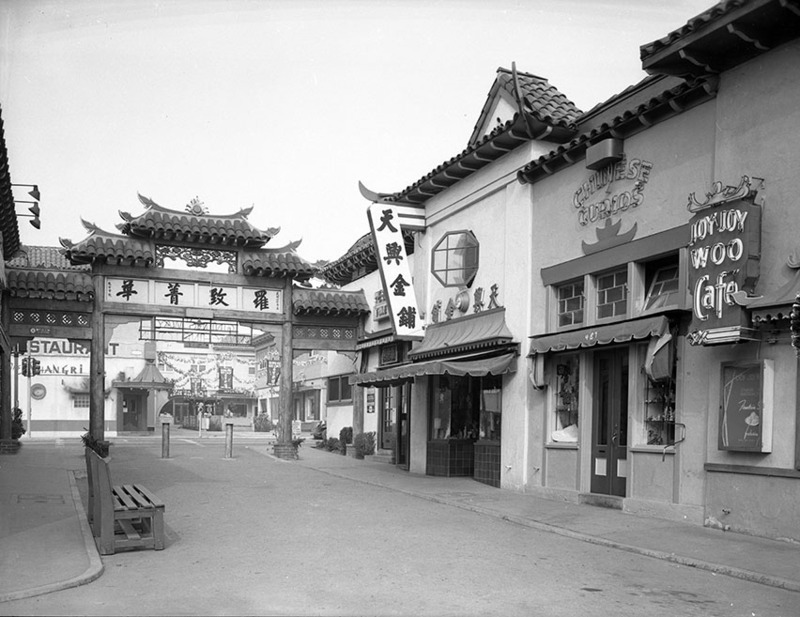 New Chinatown was conceived as a tourist destination, much like nearby Olvera Street- hence its profusion of restaurants and gift shops. 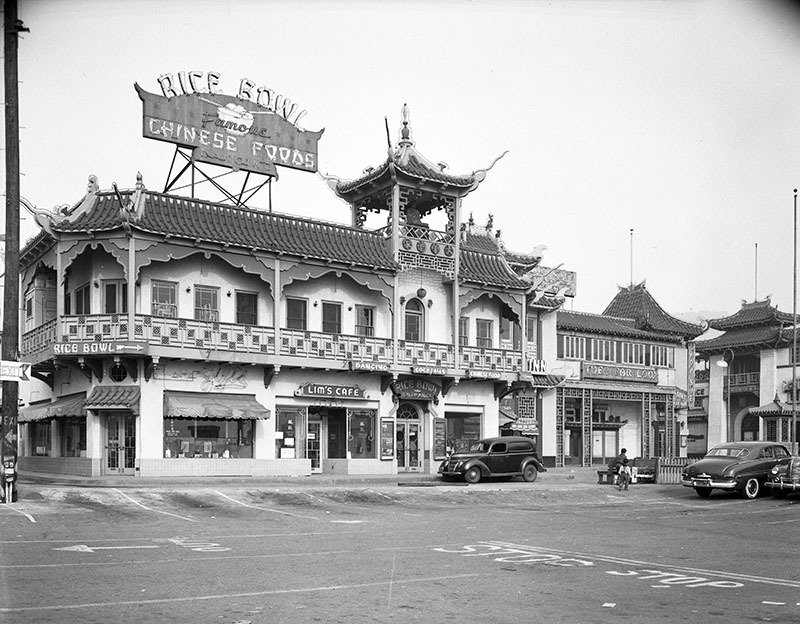 New Chinatown c. 1950: The Rice Bowl and Lim’s Cafe (previously on First Street). 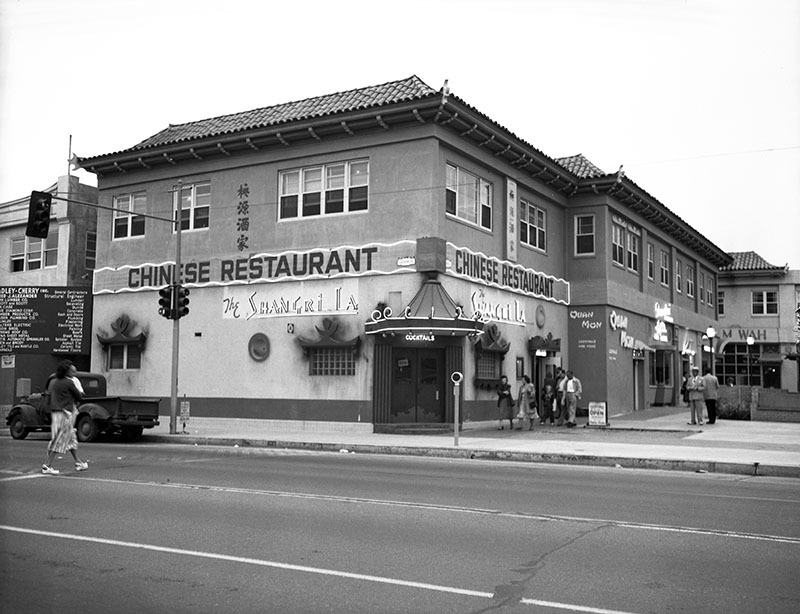 Matchbook for Chung’s Chinese Gardens restaurant 911-913 N. Broadway. 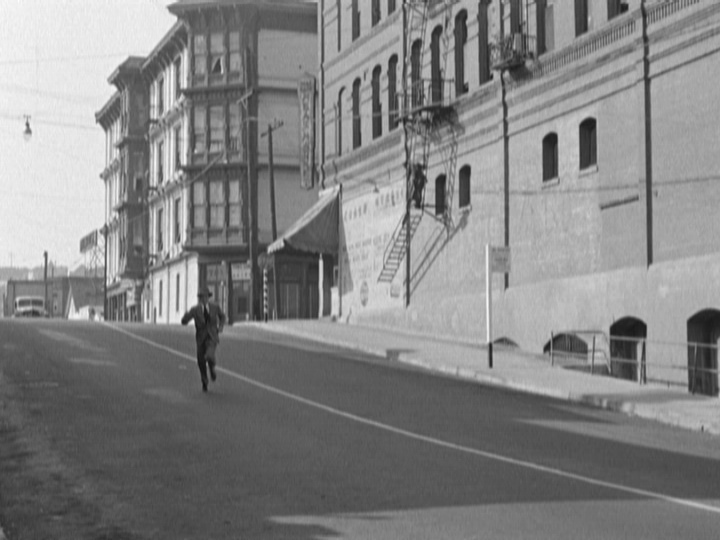 Scene in The Clay Pigeon, shot on location in Los Angeles. In The Clay Pigeon, Jim Fletcher escapes from the U.S. 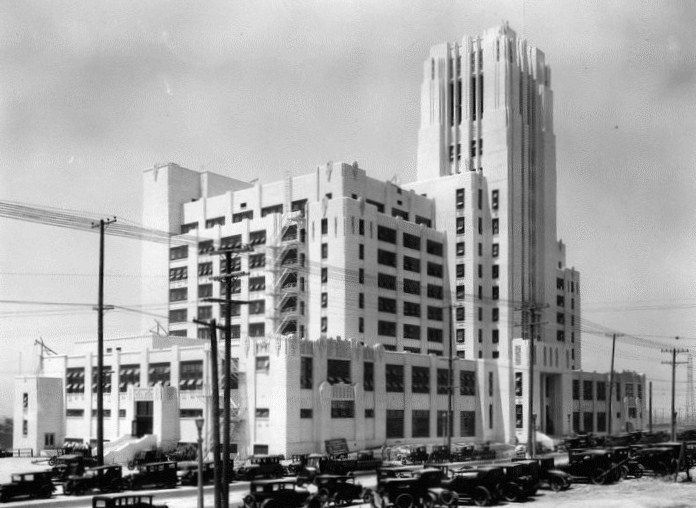 Naval Hospital in Long Beach (formerly located at 7th Street and Bellflower Blvd.). 1. Because of the international date line, the Japanese attack on the Phillipines occurred December 8, 1941. 2. A self-taught lawyer and former reporter for the Los Angeles Examiner, Lavine had been convicted in 1930 for ostensibly trying to extort LA crime boss Charles Crawford. Disbarred, he was reinstated in 1936 and went on to represent clients such as “rattlesnake murderer” Robert S. James (convicted of murdering his wife; James was the last person to be executed in California by hanging), Hollywood madme Lee Francis (a former cohort of Crawford’s), Louise Peete (convicted of murder and executed), and local underworld figures Mickey Cohen and Jimmy Utley. He was disbarred for the second time in 1954 but again reinstated. 3. Kawakita was sentenced to death and housed in the LA County jail while his case was appealed. The US Supreme Court upheld the decicion in June 1951 and again in October 1952, but President Eisenhower communted the sentence to life in prison in 1953. Kawakita was thereafter housed at Alcatraz. President John F. Kennedy ordered him freed in 1963, on the condition that he be deported to Japan and never return to the US.